Wake Up Weekend 2008: Official Schedule! *All events are free and open to the public; donations to defray costs are cheerfully accepted. Questions? Write to wakeupweekend2008@gmail.com. 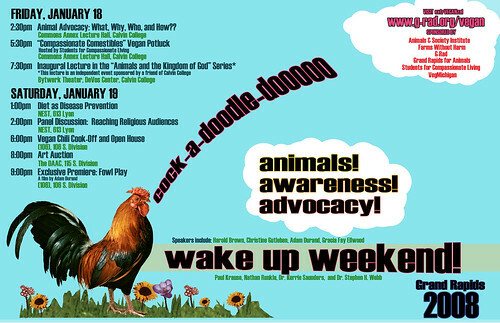 Save the Date for Wake Up Weekend 2008–a two-day celebration of animal-friendly food, art, education, and advocacy brought to you by Animals & Society Institute, ExtraVEGANza!, Farms Without Harm, G-Rad, Grand Rapids For Animals, Students for Compassionate Living, and VegMichigan. 2:30 pm–Animal Advocacy: What, Why, Who, and How? Learn what animal advocacy is all about from leading figures in the movement. Presentations by Harold Brown (President, Farm Kind), Adam Durand (President, Compassionate Consumers), Christine Gutleben (Director, Humane Society Animals and Religion), Paul Krause (VegMichigan), and Nathan Runkle (Director, Mercy For Animals). A smorgasbord of delicious vegan favorites hosted by Students for Compassionate Living. What’s cooking in your vegan kitchen? Let’s find out! “A Christian Case for Compassion for Animals,” Dr. Stephen H. Webb (Wabash College), author of Good Eating and On God and Dogs: A Christian Theology of Compassion for Animals. *This address is an independent event in a new series of lectures that has been established by a friend of Calvin College. Since the lecture is free and open to the public and likely to be of interest to Wake Up Weekend participants, the College has kindly allowed us to include Professor Webb’s lecture on our schedule. Get the lowdown on how compassionate eating can help improve your health and ward off illness from Dr. Kerrie Saunders, “Dear Dr. Kerrie” columnist for VegNews Magazine and author of The Vegan Diet as Chronic Disease Prevention. Participants in this moderated panel discussion will include Brianne Donaldson (Independent Author and Activist), Gracia Fay Ellwood (Editor, The Peaceable Table), Christine Gutleben (Director, Humane Society Animals and Religion), Dr. Kerrie Saunders, and Dr. Stephen H. Webb. Last year’s Chili Cook-off brought out 18 entries. Will we break 20 this year? Get ready to doff your chef’s toque and step up the burner! Dust off your bidding paddle and have your checkbooks at the ready, because many of the excellent artists whose generous donations helped us to raise $2200 for Farm Sanctuary and Mercy For Animals at last year’s auction will have work on the block again this year. If you’d like to donate work for auction, contact Adam Wolpa at arw3@calvin.edu. The director himself will screen a preliminary version of the film and lead a discussion with the audience afterward. Don’t miss this rare opportunity to provide feedback that could influence the final cut!